This one is my cheating recipe. No really cheat but short cut one. I think all of us can cook lentil. For Pat Shak Dal / Lentil with jute Leaf we need cook thick lentil and when lentil is cooked and add jute leaf. 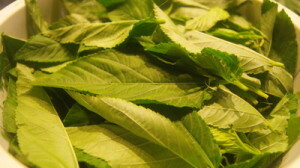 The trick of the recipe is how to cut jute leaf. Keep the whole leaf without stem. If you don’t keep whole leaf, you will get slimy lentil. Though some of us like slimy Pat Shak Dal / Lentil with jute Leaf. Traditionally lentil uses for a typical one (kalai dal) with is not available where I live so I used red lentil. 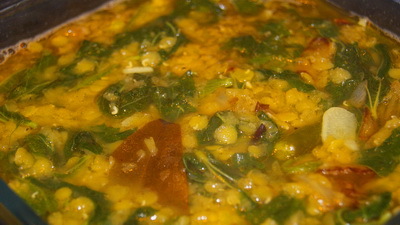 If you cook with with Kalai dal, you need to soak it about 2hours then cook same way like red lentil. If anyone want full recipe, let me know. With lots of love thanks again and don’t forget like my facebook page or join my facebook group to keep in touch with me. 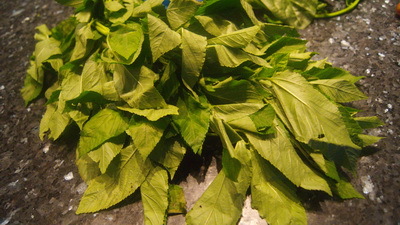 Paat shak daal is one of my favorite dish.But where can I get jute leaf in Australia? Thanks for uploading your yummy recipes. Special thanks for the traditional recipes. Dear Nashmin, I usually get pat shak from Asian vege shop. Where do you live? Just check or keep eyes on Asian or Vietnamese grocery. Usually you can get it in Summer. Thanks. Thanks a lot for your quick response. I’m from canberra. Yeah I will look for it. I have tried your komla bhog and it turned out really good. Thanks once again for your yummy recipes.